Why does Force Factor Forebrain focus on the forebrain and not, say, the occipital lobe? Is the occipital not important to you guys?? Presumably sharpness and clarity of mind. (No duh, nootropic geek.) All of which sounds pretty neat, but does Force Factor Forebrain deliver on these promises? Well, we’ll need to read the review to find out! Who Takes Force Factor Forebrain? Conclusion: Does Force Factor Forebrain Work? 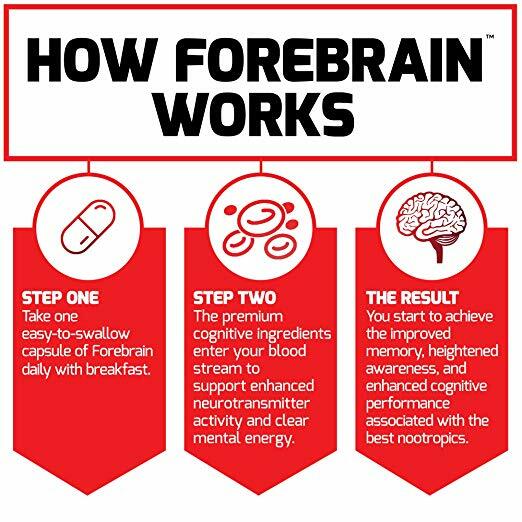 Force Factor Forebrain is a daily single-capsule nootropic formula that supplies a simple, six-ingredient stack for memory and mental performance boosts. Despite the impressive ingredient brands, Force Factor Forebrain demonstrates an impressive lack of originality, failing to justify this supplement’s fairly heavy price tag. Other Ingredients: Gelatin, Microcrystalline Cellulose, Silica, Magnesium Stearate, FD&C Yellow #5, FD&C Yellow #6, Titanium Dioxide. Directions: Take 1 capsule daily with breakfast. Bacopa Monnieri Extract (Std. to 50% Bacosides) – Hugely popular Ayurvedic herbal adaptogen, bacopa monnieri may help with memory, learning, and high-order cognitive functions. Forebrain supplies a fairly potent extract of this stuff.. More on Bacopa Monnieri. COGNIGRAPE® (Std. for Anthocyanins and Proanthocyanidins) – Essentially an antioxidant grape extract clinically found to improve cognitive function in healthy older adults. Seems great for cognitive longevity. zümXR® Extended Release Caffeine – While the “extended release” aspect of this caffeine ingredient is cool, this is still just caffeine. And not much of it, given the low overall dosage (65mg) of this blend. More on Caffeine. Thinkamine® Vincamine – Many supplements opt for the vincamine-derivative vinpocetine. However, vincamine seems to act similar to vinpocetine by increasing bloodflow to the brain, which comes with the benefit of increased oxygen and nutrients to the brain. Toothed Clubmoss (Std. for Huperzine A) – Viewed as a sort of semi-synthetic, semi-natural drug, huperzine-A seems to work by inhibiting acetylcholinesterase, the enzyme responsible for breaking down neurotransmitter acetylcholine within neuron-to-neuron synapses. More on Huperzine A.
I’m not too sure why Force Factor shelled out a trademark for this BioBrain+ “blend”, which is not at all a unique blend but a single ingredient brand known as the awesome BioPerine® black pepper extract (which a lot of other nootropic supplements carry). It’s a smart pepper extract that may help increase nutrient absorption, thereby improving Forebrain’s overall formula bioavailability. As you can see here, there’s a lot of science in the brain. And, frankly Force Factor Forebrain doesn’t do much unique or special outside of Bacopa monnieri. And, again, don’t get it twisted: I like these ingredients. And Forebrain does demonstrate having exceptional quality and potency with its premium ingredient brands — e.g., COGNIGRAPE, Thinkamine. However, when Forebrain describes its formula with phrases like “EXCLUSIVE TRIPLE-ACTION FORMULA”, I can’t help but think that Force Factor is being a bit hyperbolic here. After all, the third “action” in this formula is simply BioPerine, a nutrient absorption enhancer found in many supplements. And I suspect that much of the absorption enhancement is countered by Forebrain’s capsule’s crappy quality. What’s exactly exclusive about this formula, with exception to perhaps Thinkamine? Not much. Not to mention that Forebrain goes the proprietary blend route, obscuring its individual ingredient dosages. And the second blend’s dosage (65mg) offers less than a small coffee cup’s worth of caffeine. At best, Forebrain is a pretty decent source of Bacopa monnieri extract that may also possess significant cognitive longevity improvements for the older folk with ingredients such as grape extract and huperzine-A. But even at its best, I can point to several other nootropic supplements that outperform Forebrain. Forebrain supplies a potent Bacopa extract, coming in hot at a standardized 50% bacosides. Great for memory and learning and all-around better thinking. BioPerine black pepper extract (piperine) may significantly improve Forebrain’s nutrient absorption rates. The four ingredient brands look like potent, high quality stuff. Forebrain is not at all a unique, “exclusive” formula, as many supplements supply these ingredients. Many supplements these ingredients at a much cheaper price. Force Factor uses a lot of unwarranted, sneaky rhetoric to give the impression that this stack has been “rigorously tested” or “clinically researched” when the truth is that the ingredients have been studied independent from this formula. This supplement has not been clinically studied at all. Both the GNC and Amazon listings sell Forebrain at the pricing option above. However, at both retailers you may buy the Subscribe & Save order option, saving you money in the long run; especially, if you plan on taking this supplement for the long run. It’s difficult to gauge exactly who Force Factor Forebrain is for. The ad copy suggests that Forebrain may benefit anyone from athletes to students to “hardworking professionals” — however, I’d say Forebrain is best for the older folk. The younger folk may find Forebrain a bit too mellow and ineffective at significant impacting their mental performance. 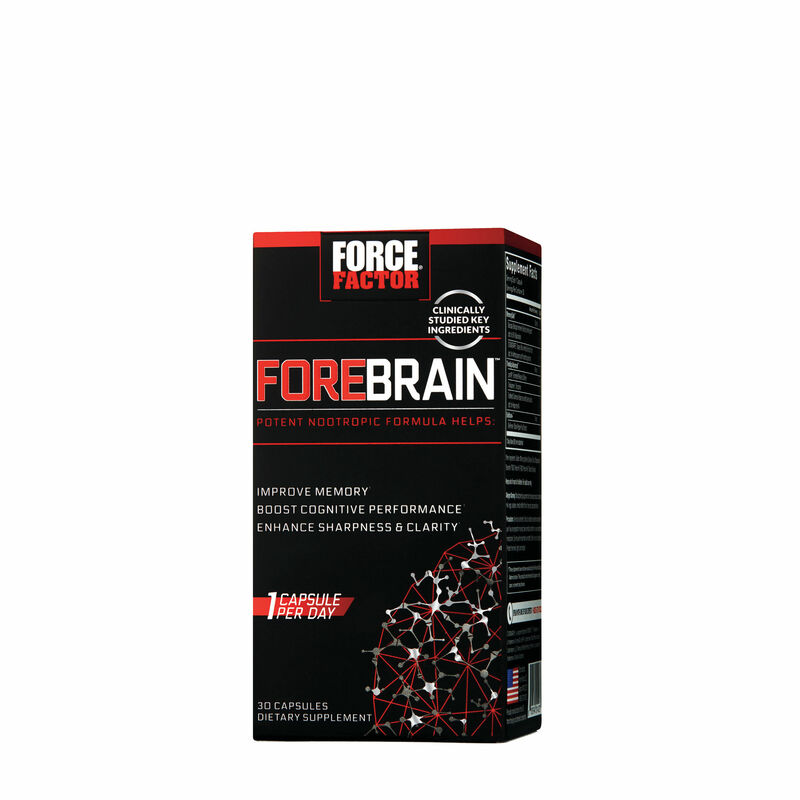 You can buy Force Factor Forebrain through various online retailers, including GNC and Amazon, as well as the Force Factor online store. Meh. I mean, sure, Force Factor Forebrain may help improve memory and age-related cognitive impairment. However, I wouldn’t recommend this supplement as the best formula for memory and cognitive repair. In other words, Force Factor Forebrain works but it doesn’t work good enough. 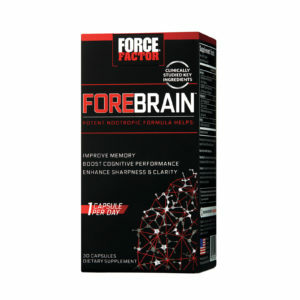 What’s worse, Force Factor Forebrain is way overpriced, considering that this isn’t the most unique formula on the market. You can easily find these ingredients elsewhere for much cheaper — and likely in addition to many more awesome nootropics. Yes, you could do much worse than this supplement, but you can also do much better. A good place to start your search is with my Best Nootropic Supplements of 2018 list.